Welcome to North Castle's Fan-Fiction Archive! 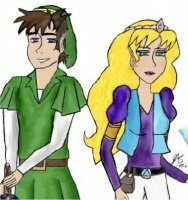 This is one of the oldest, largest and most devoted collections of Zelda Fanfiction on, the 'net. Since I was in charge of TGL's fanfiction section, I can assure you that here at North Castle, I'm equally dedicated to collecting and archiving as many Zelda-related stories as possible. Many of the stories here are exclusive to the site and a quite a few date back before 1998; you would not find these elsewhere now. Our Work: The infamous fanfiction series written by myself and my sister Kirsty. General: These stories are your just your normal, run-of-the mill adventures. Humour: This section contains basically any funny or spoof-like tales. Romance: Ahh... if you enjoy a good old love story, then this is the section for you! Crossovers: These stories contain characters from other games/TV shows/ etc. Poetry: Poetry, verses, prose and ryhmes based upon Zelda. Shorts: Check out the tales in this section if you just want a quick read. Sagas: This section contains stories that consist of several books. If you're a little stuck on how to write, be sure to check out North Castle's own writing tutorials, written by one of our favourite writers, Megan O'Shea. Once you feel your story is ready, be sure to submit it to North Castle to enjoy a special pride of place within these archives, by following the instructions below. I no longer accept UNFINISHED submissions. The reason being is too many people *forget* to finish their work. Please make sure the story is complete before it is sent thank you. Include your name, story title and what section you want it to be in. State which game it's based on, and the age rating (like in film ratings). If your story is multi-part, remember to send a short summary to go with it. If possible, run it through a spell-checker and make sure the grammar is decent. I simply do not have the time to make these corrections myself and any that don't make the grade I will send back requesting you correct it. You may submit your submission in the following formats; word document (NOT docx format), HTML or plain text. If the story is short, you may paste it into the email body. T his section contains the majority of stories written by myself and my sister Kirsty about the Legend of Zelda. They are loosely based on the original Zelda games and the cartoon and have influences from the other games. We wrote the series over several years and they are some of the most-loved and oldest Zelda fan-fictions ever written. I often look back now and wish I could improve them but they're so long, it would simply take forever! We hope you still enjoy reading them as much as we enjoyed writing them. I've had so many emails over the years from people - me and Kirsty really appreciate all the support that we've had from you guys. We rarely write now because we work full-time and have partners but you can sometimes find the odd short story in the other sections on the site written by us. In order to help understand more out our series I've also written an Almanac - a guide to all the places and characters featured in the stories. If you have any questions or would like permission to use any of our characters than you're more than welcome to drop either of us an email and we'll do our best to answer. This is an UNOFFICIAL site and is in no way supported by Nintendo . The Legend of Zelda™, Link, Princess Zelda, Ganon and other related characters belong to Nintendo . The images and information on these pages are purely for entertainment value only. All texts accessed from this page belong to the authors mentioned, and may not be used without the owner's permission, via email. This page was created by Conrad VanderWoude and Juliet A. Singleton © 1998-2009. All rights reserved.